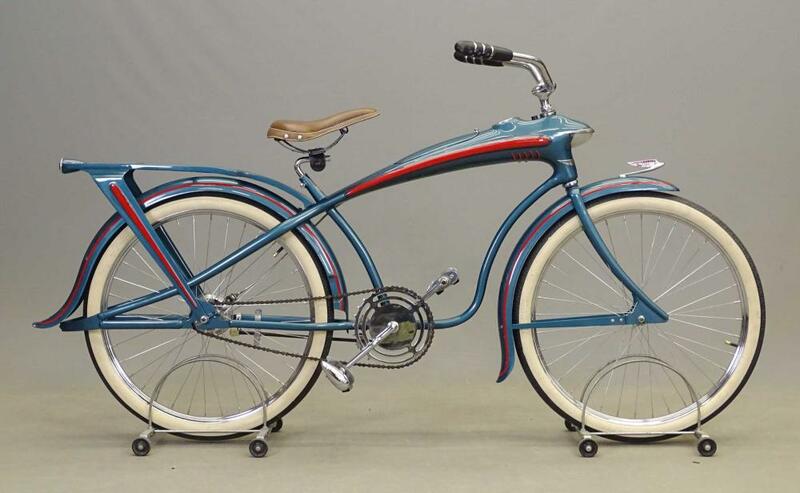 28th Annual Bicycle and Automobilia Auction and Swap Meet will feature bicycles and bicycle, automobile and transportation related memorabilia, collectibles, signs, art, posters, parts & accessories, ephemera and more! All items are sold "as is" and neither the auctioneer nor the consignor makes any warranties or representations of any kind with respect to the items, and in no event shall they be responsible for the correctness of the catalogue or other description of the physical condition, size, quality, rarity, importance, medium, provenance, period, source, origin or historical relevance of the items and no statement anywhere, whether oral or written, shall be deemed such a warranty or representation. Prospective bidders should inspect the merchandise thoroughly before bidding to determine its condition, size and whether or not it has been repaired or restored. All sales are final & refunds will not be given. The auctioneer reserves the right to withdraw any merchandise before the sale and shall have no liability whatsoever for such withdrawal. As a service to our customers the COPAKE AUCTION will execute absentee bids if so authorized in writing. All absentee bids will be executed competitively during the sale. Items will be purchased for the lowest price possible regardless of the amount of the order bid. Where two absentee bidders bid the same amount the first received will be honored. This service is offered as a convenience and COPAKE AUCTION will not be responsible for any errors or failures to properly execute the bids. On the fall of the auctioneers hammer, ownership to the offered lot will pass to the highest bidder acknowledged by the auctioneer, and as such the bidder assumes full risk and responsibility and will pay the full purchase price of the item(s). Payment Terms: Cash - Checks - Visa - MasterCard - Discover - Wire Transfer ($15.00 fee). WE DO NOT SHIP IN HOUSE OR GIVE SHIPPING ESTIMATES. Buyer Pays Actual Shipping Cost. We take all items within size/weight restrictions to our local UPS store. WE PUT BUYERS IN TOUCH WITH UPS ONCE WE DELIVER THEM,PLEASE CONTACT THEM FOR ALL ESTIMATE/COSTs. Email: store5539@theupsstore.com, Phone: 518-828-8777. For larger items we recommend carriers such as Plycon Transportation P: 631-269-7000 Contact: Chris Pliaconis Email: cap@plycongroup.com - We will assist you in arranging shipping, however we do no shipping in house nor do we give shipping estimates. All items are subject to a 18% buyer's premium or a 23% buyer's premium for all ONLINE live bidding platform purchases (LIVEAUCTIONEERS, INVALUABLE/AUCTIONZIP) which will be added to the successful bid price and is payable by the purchaser as part of the total purchase price. All New York State Residents pay 8% sales tax unless the purchaser possesses a sales tax exemption number. We must have a copy of certificate if claiming exemption. Description: 1903 Crestmobile booklet. Manufactured in Cambridge Mass.. 5 1/2" x 6 3/4". Good condition. Description: Replica rotary tandem designed by Mel Short. Badge reads Rotary Tandem #2, M. L. Short, 1992. Good condition. Description: C. 1920's Springfield School Bus Bodies catalog. Manufactured in Cambridge Mass.. 10 3/4" x 8 1/4". Good condition. Description: Lot (16) early touring car photographs including early tour bus examples, rare tintype photo pose. Largest 10" x 12". Good condition. Description: Early brass figural bicycle clock. Man posed with safety bicycle. 7 1/2" x 3" x 6 1/2" Ht.. Description: Vintage Motor Club Of American clock. 25 1/2" x 10 1/2". Cracked near hands. Description: Lot (3) C. 1970 "Run For The Sea" bronze plaques. You had to complete the run to receive plaque. Good condition. Description: Lot (2) pairs of Cowl lamps with spare parts. Description: Pair of bronze truck bookends. Good condition. Description: Peter Helck book "THE CHECKERED FLAG" in original slip case signed by Helck. Good condition. Description: 1890's Iver Johnson Lovell Diamond Hard Tire Safety bicycle. 30" wheels. Restored condition. Description: Rare oak Victorian rocking chair with pressed back with bicycle design. 17" seat Ht., 38" overall Ht.. Some loss to leather seat. Description: C. 1950's-60's canvas banner "Mobilgas Economy Run". 6' 10" x 3' 8". Good condition. Description: Lot including 1890 Weston Instrument Company Ammeter in wooden case and cased automatic cutout. Description: C. 1950's-60's canvas banner "High Energy Gasoline...United States Auto Club / Proved in the Mobil Economy Run". Imperfections. 7' 10" x 3' 8". Description: Scarce Victorian glass hat holder with cycling motif. 10" Ht.. Good condition. Description: C. 1960's poster "New Mobil Credit Service". 47" x 34". Imperfections. Description: C. 1960's poster Mobil Permazone". 47" x 34". Imperfections. Description: C. 1960's poster "Season's Greetings Mobil". 47" x 34". Imperfections. 47" x 34". Description: C. 1960's poster "Spring Mobil Care". 47" x 34". Imperfections. 47" x 34".